Like a year ago author/Derrick Comedian D.C. Pierson tweeted a link to a video in which a man is handcuffed to a steel bar next to a robot claw that will remove his pants, exposing him to bleachers full of young children in front of a cop, if he doesn’t pick the lock to the handcuffs in 90 seconds or less. 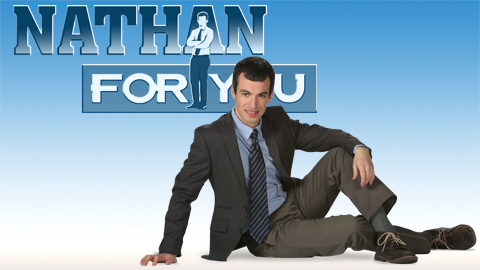 The show is called Nathan For You and it follows host Nathan Fielder as he pitches provocative gimmicks to small businesses. The first season is currently streaming on Hulu Plus and though it might be eight episodes long it felt like I watched the entire run in five minutes. Luckily, the second season premieres on Comedy Central today, July 1st. I haven’t laughed as hard as I did watching the first season of Nathan For You since I saw the series premiere of Comedy Bang! Bang! I’m chomping at the bit for more, and I absolutely cannot wait to stream the premiere of season two the day after it airs because I go to bed early. But I can’t help but wonder, when the hell did this happen? For the longest time it seemed like, Stewart and Colbert aside, Comedy Central was sort of just a Lazy Susan of disposable, raunchy comedies desperately trying to fill the shoes of Dave Chappelle or sustain the ratings lead provided by South Park on Wednesday nights. Somehow, while I wasn’t looking, it seems Comedy Central, with the likes of Key & Peele, Inside Amy Schumer, Nathan For You and Review, has transformed into a bastion of prestige comedy. The term “prestige drama” gets thrown around a lot, usually in reference to Mad Men or Breaking Bad. I myself would throw in Hannibal and True Detective and I’m sure you’ve got a shortlist yourself. To me it’s indicative of a series that is consistently thought-provoking and often enough transcends the constraints of television either through how it makes us feel or think. Only it would appear that transcendent quality is no longer limited to hour-long, Sunday-night dramas. Much like True Detective could have just been a murder mystery, or Hannibal could have just been a shameless franchise prequel, Nathan For You could have been a pretty mean-spirited show that garnered cheap laughs by relying on people to embarrass themselves on camera. Nathan For You doesn’t entirely lack that sense of pulling one over on unsuspecting bystanders, but its reliance on embarrassing people is extremely minimal, as the show is instead entirely more concerned with the inherent comedy of business. When you begin to think about why people buy what they buy where they buy it, or why and how the people we buy things from sell the things they do, you quickly find yourself in pretty strange territory. Territory Nathan Fielder basks in for our amusement and, hopefully, reflection. There’s an episode of Nathan For You in which he convinces a gas station owner to sell gas for $1.75 after rebate. It is hilarious, sure, but it’s also one of the most fascinating episodes of television I’ve seen recently. And I’m rewatching True Detective. On Blu-Ray! That I’m still deeply considering an episode of a half-hour show on Comedy Central nearly a week after viewing it is quite a testament. CBS may still be a thing, but make no mistake, we’re living at the dawn of the prestige comedy. Sure, there have been phenomenal comedies throughout television history, but the sheer quantity of insightful, well-written comedies on television today is staggering. 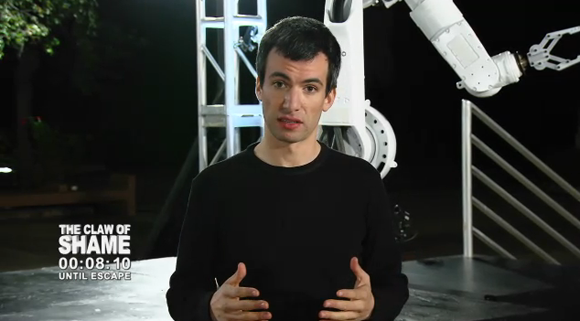 Definitely check out Nathan For You. And Nathan, if you could get more people to listen to my podcast, that would be great. 1. What is your favorite prestige drama? Is it ER? 2. Remember that episode of ER where that guy dies on the beach or whatever? Bummer. 3. Remember that song they play on that episode of ER where that guy dies on the beach or whatever? Bummer.